When I met my husband, I quickly learned that his favorite food was something I had never given much attention to: lasagna. 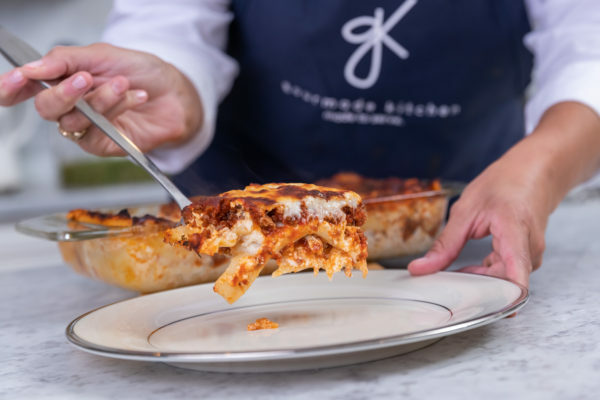 Determined to satisfy his taste buds, I set out to master the art of lasagna and record the perfect recipe. From my mom, I took an old sauce secret that she used in her spaghetti. From his mom, I took the tip of combining both ricotta and cottage cheeses for the perfect creamy layer. Too much salt, not enough kick. More oregano, less meat. Cook noodles until al dente, but actually a minute less. Layer twice, no, three times. Pounds of mozzarella later, I had it: the perfect lasagna. The one that made my husband smile and nod, because he couldn’t speak for eating. I served it at a dinner party or two and always had someone asking me for the recipe before the night’s end. It became sort of “my thing,” and friends asked for it often. I started taking it to anyone who needed food: new moms, church suppers, hurting friends. It’s amazing the joy a simple meal can bring- to both chef and recipient. Pretty soon I was dreaming of this business, and making another favorite, twice baked potato casserole, for a school PTA event. A combination of events sparked the idea that is now Gourmade Kitchen. The lack of gourmet to-go options in Tuscaloosa, encouragement from a few friends, and in hindsight, my husband’s favorite lasagna.